Operation Clean Sweep (OCS) is voluntary stewardship program for facilities that handle plastic materials. Administered jointly by SPI: The Plastics Industry Trade Association and the American Chemistry Council (ACC), OCS is designed to help facilities implement procedures to keep plastic materials out of our waterways and eliminate plastic pellet, flake and powder loss. This year marks the 25th anniversary of Operation Clean Sweep. Today OCS is being implemented in 23 countries around the world, by companies in 34 states in the U.S. Through the tireless efforts of OCS’ supporters and partners, the plastics industry has made significant strides towards zero plastic pellet, flake and powder loss. OCS is an ever-changing program, but the goal of eliminating pellet, flake and powder loss has not changed. Here’s a look back at some important milestones in OCS history. 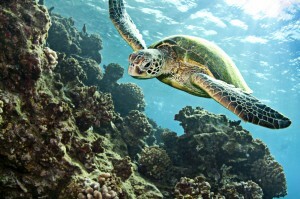 The Environmental Protection Agency (EPA) and the Center for Marine Conservation (now known as the Ocean Conservancy) conducted studies that detected plastic pellets in U.S. waterways from the Atlantic to the Pacific. 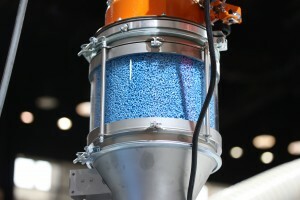 SPI began working towards a solution to contain plastic pellet loss, creating educational programs for the U.S. plastics industry. Additionally, SPI’s Resin Pellet Task Force was established to educate the plastics industry and consumers about the negative consequences of plastic pellets in the marine environment. Operation Clean Sweep was created by SPI. Companies throughout the plastics industry signed the pledge to work toward zero plastic pellet loss. ACC partnered with SPI and created the OCS website, which offered an online manual, and other tools, to assist companies with implementing their own OCS program to reduce pellet loss. SPI released OCS as a royalty-free license for international plastic organizations, enabling organizations like the Canadian Plastics Industry Association (CPIA), the Asociación Nacional de Industrias del Plástico (ANIPAC) and others to promote OCS to their own members and encouraging companies to implement the OCS guidelines at facilities all over the world. 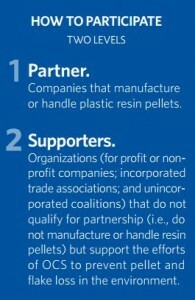 OCS created a new supporter category allowing companies who do not directly manufacture or handle plastic materials to publically support the mission of OCS. Supporters of OCS pledge to encourage other companies, associations and coalitions to participate in OCS and educate customers, suppliers and member companies about the program. 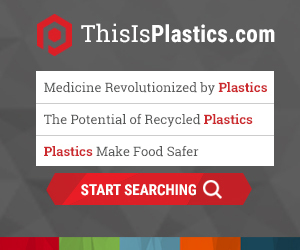 Two new categories of plastics materials, plastic flakes and powder, joined plastic pellets in the OCS mission statement. The addition of these two types of material widened the scope of OCS, expanding beyond one specific aspect of the plastic life cycle to welcome recyclers and other companies that regularly handle plastic materials. OCS 2.0 was launched. Now, OCS counts facilities rather than companies to give a more accurate representation of the industry. Although OCS has made a positive impact on the plastics industry and the global marine environment, the program continues to expand through its growing number of global partnerships. No matter where your facility is located, OCS offers all plastics-handling companies an extensive manual of best management practices to implement, free of charge. If your company has not signed the pledge to join and participate in OCS, there has never been a better time to do so. Together, we can eventually achieve Operation Clean Sweep’s goal of zero pellet, flake, and powder loss.